iCloud will automatically sync Safari history between all Mac and iOS devices that are using the same Apple ID and that have the feature enabled. While this happens automatically and behind the scenes on a regular occurrence, you may encounter a situation where a particular Mac or iPhone was offline for a period of time, and the Safari history becomes out of sync. In such a situation, you can either wait for iCloud to sync the Safari history on it’s own, or, as we’ll cover here, forcibly sync the Safari history through iCloud. To be clear, this will forcibly sync Safari history with any and all devices attached to the same Apple ID and using iCloud, whether running iOS or OS X it doesn’t matter, but the process is initiated from Safari on the Mac. In order to be able to have access to this feature, you’ll need to enable the hidden Safari debug menu first, and a modern version of Safari. It’s that simple, wait a minute or so and all iCloud attached devices with Safari history should sync and update with whatever changes to Safari history that has occurred on each device, which are then accessible from iCloud Tabs in iOS and Mac OS X. Do keep in mind that any deleted history will not sync, and is removed from all devices that are using the same Apple ID simultaneously. This trick can also be used to force those changes to sync as well, however. This is mostly a troubleshooting trick, but the Debug menu in Safari has some other interesting options as well, though it’s generally aimed at developers and those debugging Safari itself, web pages, and web apps. 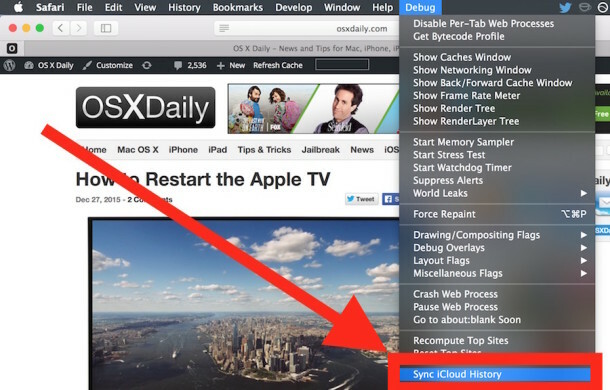 Syncing iCloud – I dan have “debug” How can I bring it up? That version of Safari doesn’t even support iCloud Tabs & History. I’m not sure what the advantage of iTunes 10.7 is, I know iTunes is horribly slow and buggy. But at some point you need to update OS X (There are numerous security and bug fixes in the updates). Not surprising. Running old software won’t have the latest features, including iCloud support. Is it worth updating OS X just to get a few tiny features you likely won’t use that much? Not to me, but for some, maybe. OS X upgrades are often downgrades for performance, stay with 10.9.5 if you ask me. 3 years later, tip still works.